The Zhuang women have become particularly self-sufficient when it comes to making their own clothes. They grow and harvest cotton, which they then spin into thread and weave into cloth. They dye the cloth using locally sourced plants or vegetables and embroider it with great skill. At this rate, they could practically start their own clothing range! 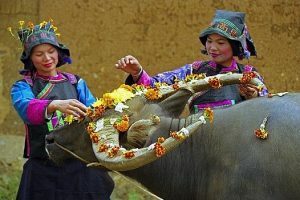 Since the Zhuang population is so widespread and diverse, their traditional dress varies greatly from region to region but tends to be characterised by the use of muted colours such as black, blue and brown. 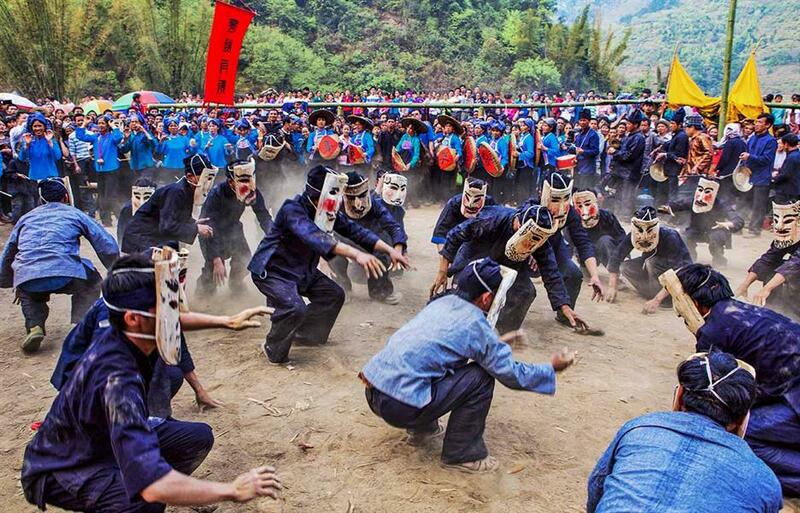 Throughout Guangxi the men typically wear a collarless jacket that either buttons up the centre or the right side. They wear loose trousers that are sometimes embroidered at the hem and occasionally will don a round cap or formal hat. The women in northwest Guangxi tend to wear collarless, embroidered jackets that button along the left side with either wide trousers or pleated skirts. Married women will wear embroidered belts or will have a band embroidered around their jacket. 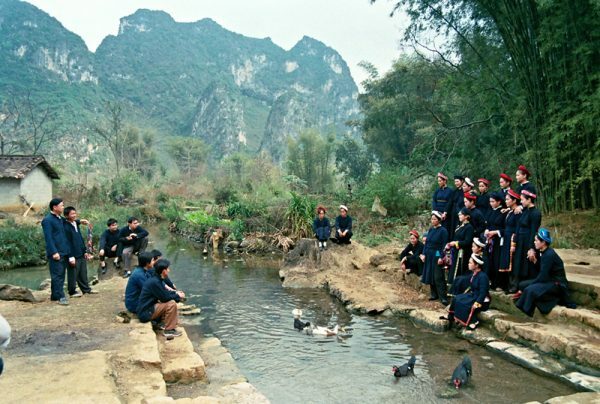 In southwest Guangxi the women also wear collarless jackets that button up the left side but prefer to wear black square headbands and loose trousers. Most women will complement their outfits with silver jewellery and some wear a variety of beautiful turbans or headscarves on festival occasions. These vibrant headscarves can be so large that they practically dwarf the wearer and look like colourful fans atop the women’s heads. Ping’an Village has become by far one of the most famous locations to witness and hike up the magnificent Longji Rice Terraces of Longsheng County. 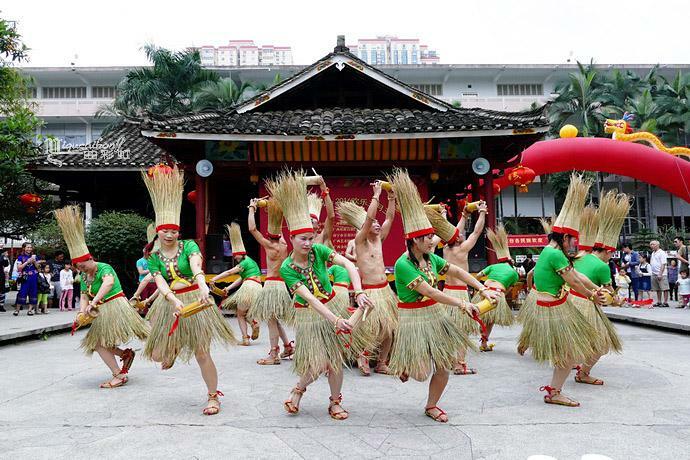 It is located about 100 kilometres (62 miles) away from Guilin city and is home to over 50 families, with a population of about 200 people in total. 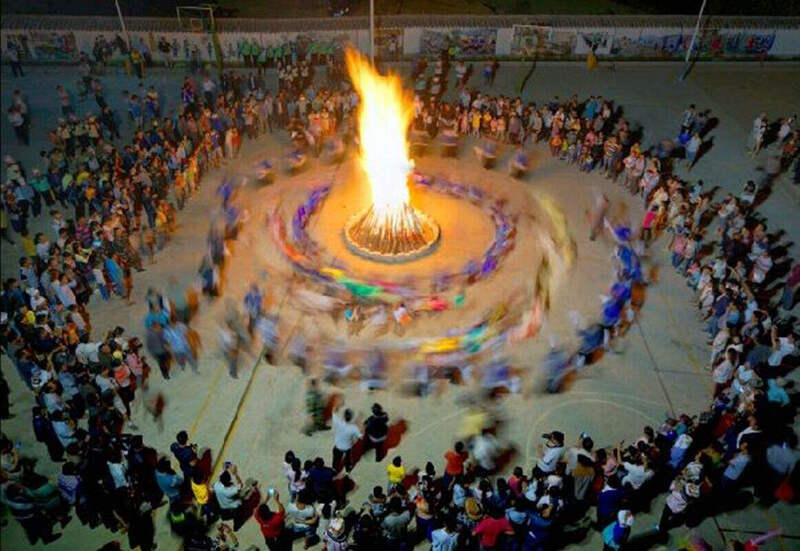 The vast majority of people living in Ping’an are of the Zhuang ethnic minority and so it is sometimes referred to as Ping’an Zhuang Village. These Zhuang locals have been living in this area for over 600 years and their ancestors built the Longji Rice Terraces that are still in use today. These rice terraces stretch up the mountain, from 300 metres up to 1,100 metres above the sea level, and were first built during the Yuan Dynasty (1271-1368), although they were not finished until the early Qing Dynasty (1644-1911). The rice terraces near Ping’an are considered to be the earliest and most developed in the Longji Scenic Area, which is why Ping’an is the most popular village for tourists. This has both its advantages and its pitfalls. Since Ping’an is far more tourist oriented than the other villages, there are plenty of guesthouses, restaurants and other modern amenities available there that the other villages simply aren’t equipped with. That being said, the downside of this is that Ping’an is far more crowded than the other villages so, if you want a more rugged, remote tour of the rice terraces, perhaps Ping’an is not the place for you. The village of Ping’an is characterised by its 80 households, which are three-storey stilted wooden houses that have lasted for over 100 years. Like the Miao ethnic minority, the Zhuang people also refer to these houses as Diaojiaolou, although the architectural style greatly differs from that of its Miao counterpart. 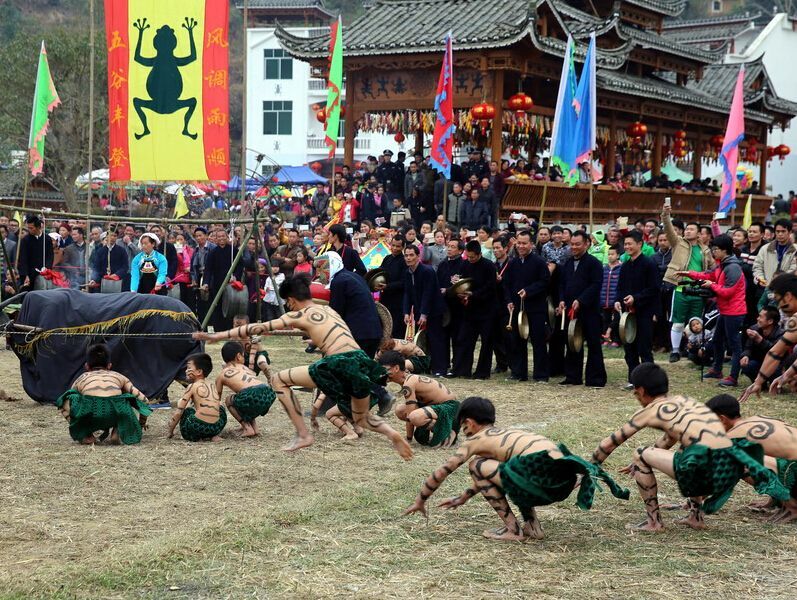 The Zhuang Diaojiaolou are built on flat ground, unlike those of the Miao people, and each of the three storeys will have a hemp railing. The top two storeys are supported by the large wooden pillars below and are used mainly as living spaces. The bottom or ground floor is used as a stable for domestic animals. All of these little homes, stacked next to one another in neat wooden piles, make the village of Ping’an look rather quaint and adorable. 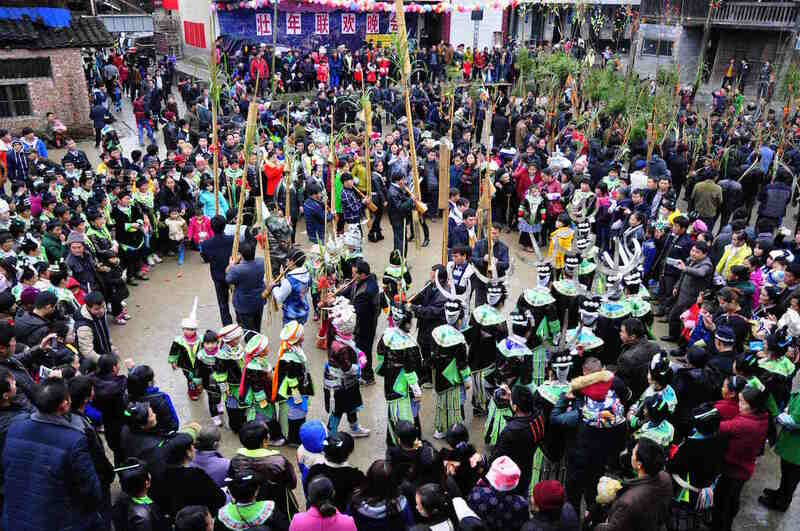 The Zhuang people living in Ping’an still maintain many of their ethnic customs, so Ping’an is also a wonderful place to experience the daily life of the Zhuang ethnic minority. The men wear hand woven long sleeved shirts and trousers whilst the women wear white shirts, black pants and colourful cloths or wraps atop their heads. 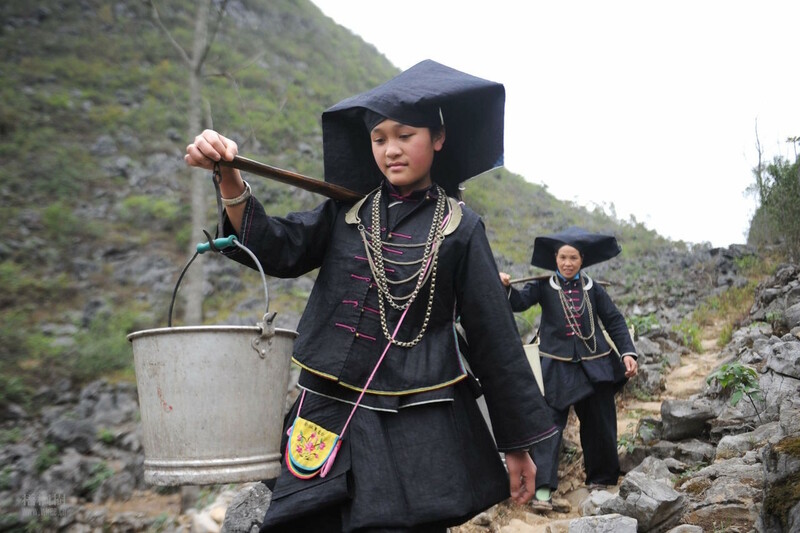 This traditional dress is far simpler than many other ethnic minorities and reflects the humble, industrious lifestyle of the Zhuang people. As you walk through the streets of Ping’an, you’ll notice that village life has remained largely the same for decades. The adults still diligently farm the fields, the children still play with their modest toys, and the elderly still sit on their doorsteps, chatting or snacking on sunflower seeds. With the backdrop of the golden rice terraces in the distance, Ping’an is truly a rural paradise. The two main attractions in the village are the two scenic spots known as “Seven Stars Surrounding the Moon” and “Nine Dragons and Five Tigers”. “Seven Stars Surrounding the Moon” consists of seven small piles that stand separately in the middle of seven rice paddies. These seven piles are remnants from the construction of the rice paddies. There is another, empty rice paddy in the centre and, when it is filled with water, it is said to look like a small moon with the seven piles surrounding it resembling the stars. “Nine Dragons and Five Tigers” are nine ridges that have branched off from the main terrace and five nearby piles leftover from their construction. The nine ridges look like nine dragons winding their way towards the Jinsha River to drink and the five piles resemble five tigers guarding the dragons and the land. These two scenic spots provide a perfect birds-eye view from which to admire and take photographs of the rice terraces billowing out across the mountains. From Ping’an, there are many hiking trails along the Longji Rice Terraces, the shortest of which will normally take about 2 hours. You can also hike from Ping’an to Longji Village, which takes about 2 hours, and, if you’re feeling particularly adventurous, you can hike from Ping’an to Dazhai, which takes 5 to 6 hours. In this case, it is advisable that you stay overnight in either Ping’an or Dazhai. These hikes are a wonderful way to exercise, enjoy the fresh mountain air, and wander through the terraced fields at your own pace. These rice terraces look particularly beautiful at sunrise and sunset, meaning any traveller would benefit from an overnight stay in Ping’an. Since Ping’an has been developed as a tourist site, the facilities and hotels in the region are much better than in other villages. The village boasts about 80 hostels and hotels, which are all of a good standard. Li An Lodge, a four-storied hotel located on top of the rice terraces near to the “Seven Stars Surrounding the Moon” scenic area, is considered to be the best hotel in the area. The stunning views from its balconies and its beautifully decorated rooms have made it exceedingly popular with tourists. However, the hotel only has 20 rooms and they can be quite expensive so it is important to book well in advance. There are plenty of lovely restaurants in Ping’an that offer a variety of home-cooked, local cuisine. The most popular local dish is called Bamboo Rice and consists of roasted meat, rice, taro or pumpkin and spices that have been stuffed into a fresh bamboo tube. The bamboo tube is then filled with a small amount of water and sealed using a corn cob. The tube is roasted on an open fire until the bamboo has turned black and the ingredients are thoroughly cooked. The soft roasted rice absorbs the tender flavours of the bamboo and spices, giving this dish its distinctive flavour. 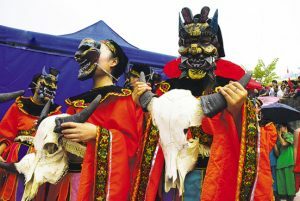 Other local dishes include a kind of locally cured and preserved bacon and a spicy sauce known as Longji Spicy Chilli Sauce that is made from locally sourced chillies. 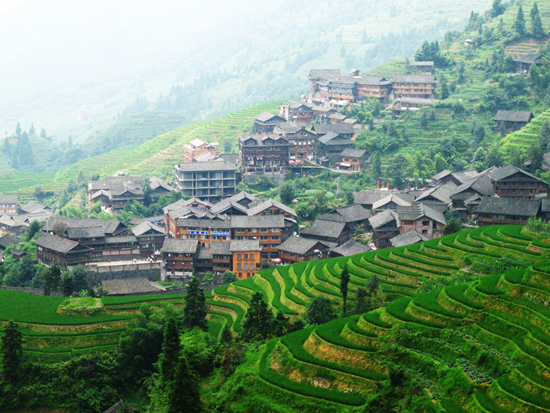 Ping’an is the most accessible village in the Longji Rice Terrace Scenic Area. First you need to take the express bus from Guilin to Longsheng County Town, which takes about 2 hours. The buses between Guilin and Longsheng are very regular and usually run at 15-minute intervals. 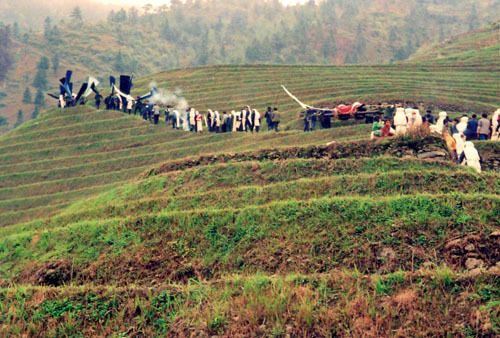 In Longsheng you’ll need to purchase your tickets for the rice terraces. From Longsheng, you’ll have to take another bus to Ping’an Parking Lot, which should only take you about an hour. The parking lot is not actually in Ping’an so you’ll need to walk about another 20 minutes to get into the village proper. If you are only taking a day trip to Ping’an, you’ll need to arrive and leave early. The last bus from Ping’an to Longsheng departs at 4.30pm every day, so be sure not to miss it! We recommend you bring some warmer clothes with you and a raincoat, as the rice terraces will get cooler as you ascend them and the wind makes it difficult to carry an umbrella if it rains. Please also remember to ask permission of any of the locals before taking photos of them.